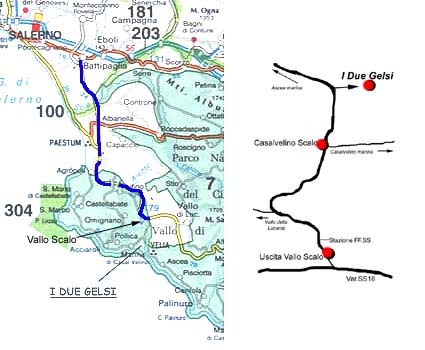 Few Km from Elea - Velia and Marina di Casalvelino I Due Gelsi is easy to reach both by car and by train. By car: A3 Motorway (Napoli/Pompei/Salerno/Raggio Calabria) exit Battipaglia, proceed toward Paestum with SS18, exit Vallo Scalo and then toward Casalvelino. By train: Napoli/Salerno/Reggio Calabria line, Casalvelino station, 10Km from I Due Gelsi. Please ask us for transfer from station to the farm.